Ireland’s leading department store, Arnotts, wanted to create something new and innovative for shoppers to entice them in-store at the key Christmas retail period. The Arnotts Gifts app followed a strategic business decision to transition from a printed gift guide to a measured digital platform. Using an advent calendar theme, the app was tasked with driving footfall to different departments in-store, with no-purchase-necessary ‘Free Gifts’ delivered via in-app mobile coupons. Arnotts engaged with Púca who adapted their ‘smart codes’ mobile platform to create a unique mobile app experience for Arnotts’ customers. The Arnotts Gifts app was conceived as the ultimate gift guide, embracing mobile technology as well as integrating a consumer digital interface with a real-time shopping experience. The gift guide featured 1400 gift ideas (increased from 200 in the former printed version) driving awareness of the depth and breadth of brands and products available at Arnotts. 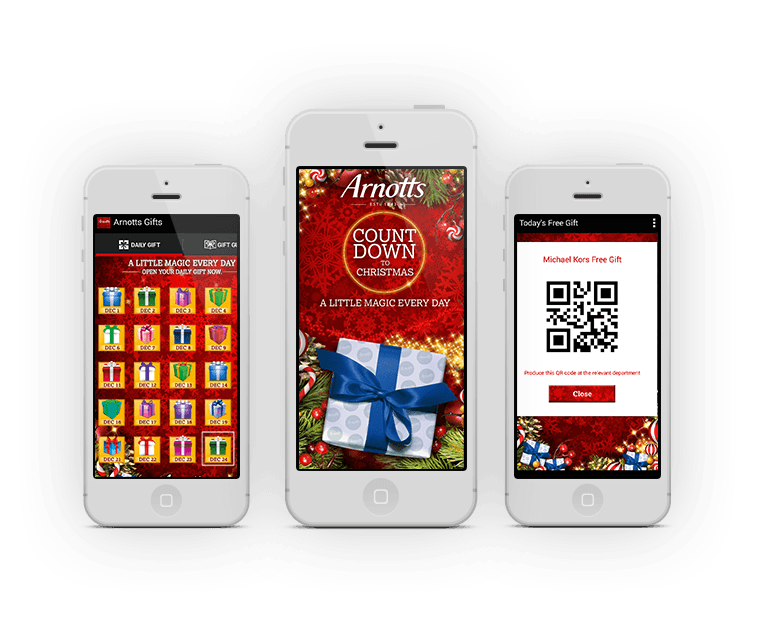 The “Countdown to Christmas” advent calendar within the app, which revealed daily free gifts and competitions differentiated the store from other retailers and brought a little of the Arnotts Christmas magic to their customers. Each day leading up to Christmas a different mobile coupon was made available within the app which the users needed to present at the point of sale within Arnotts where each voucher was scanned. Numbers of coupons issued were strictly controlled to ensure stock availability and prevent over-redemption. A daily competition was also incorporated into the advent calendar theme, culminating in one app user winning a winning a €2,500 shopping spree on Christmas Day. The app was integrated with the Facebook and Twitter API’s allowing users to register via these platforms and also to share content directly from the app with their friends and followers. Within the first four days of launching the app ranked in the number one spot in the Irish app store lifestyle category and remained in the top 10 for the duration of the promotion. Downloads far exceeded expectations, with each user logging into the app on average 11.96 times an average during the course of the campaign. The mobile coupons proved so popular that queues of up to 150 people outside the store before 8am were a daily occurrence to claim the daily free gift coupon and this also helped to build additional ‘buzz’ and extra store footfall. Arnotts’ Twitter and Facebook pages captured thousands of additional followers from the app promotional posts shared by users. The app also resulted in a significant increase in online sales for Arnotts; provided some key consumer insights; and generated substantial coverage for the retailer throughout the Irish media.